I have been telling you guys over and over how much I love the Filipino Food served at Golden Cowrie. 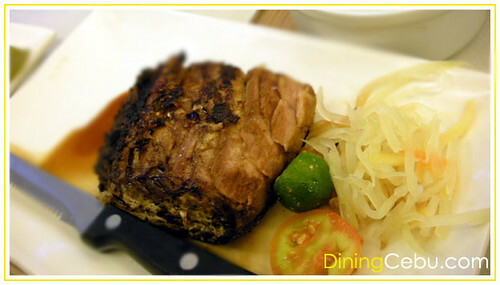 I have even told you that it is one of the best Filipino Restaurants in Cebu. I still believe that they are the best despite my unpleasant experience in Hukad sa Golden Cowrie at the Terraces Ayala Cebu. We dined in Hukad December last year and ordered some of my favorite food and some of their best sellers. I did not post any review of it yet until now for one good reason: I was disappointed with their food and service. 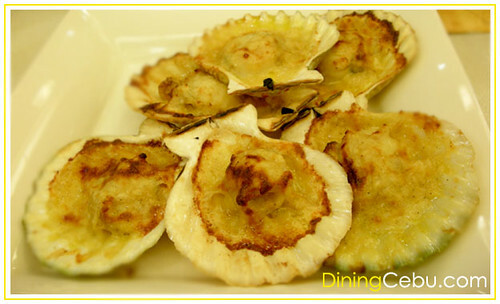 Golden Cowrie’s Baked Scallop is a good aphrodisiac for your eating desires. This is a must-order dish to set the mood of your dining experience. 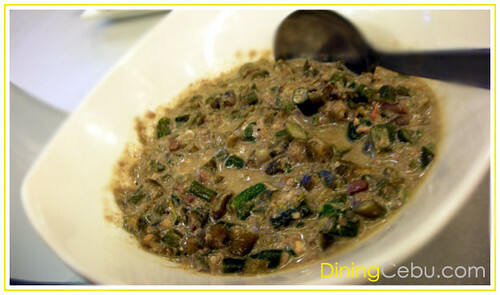 Golden Cowrie’s Bicol Express looks very weird to me. It’s just too dirty green for my eyes and definitely not appetizing. I was hoping for something more of a milky white color highlighting the presence of coconut milk. The Bicol Express tasted just all right but I couldn’t get past the color issue so I did not eat much of it. 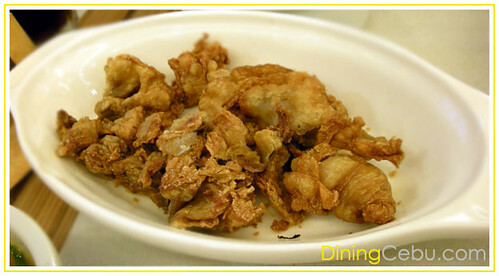 Golden Cowrie’s Chicharon Bulaklak is always a hit for me. I like it because everything is crispy and spiced just right. I like Golden Cowrie’s Sinigang because it has the right “asim” factor that I look for in a sinigang. The Baby Prawns served were really babies because they were not as big as I would have wanted them to be. I like the bigger prawns because sometimes I lose patience taking out the shells. I am not really a fish expert but I can say that Golden Cowrie’s Blue Marlin was just okay. The serving size is just enough for what you pay for. It was grilled just okay. Okay now how many times do I have to say okay? Okay? Nothing special, okay? This is the first time I ordered Golden Cowrie’s Kare-Kare. I have tried the Kare-Kare at Pino Filipino Restaurant and find it just all right because my problem with it was that the soup was not too thick. 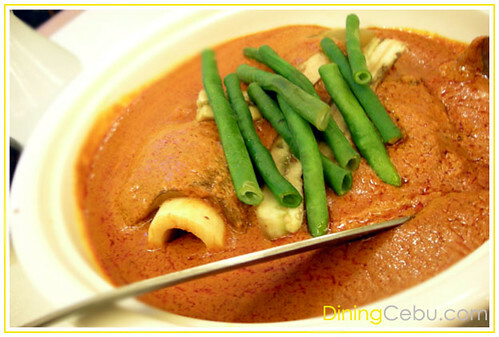 But Golden Cowrie’s version of the Kare-Kare was worse! Sorry but I do not understand why there wasn’t any beef meat there and it was all (I believe to be) tripe. It was just too much for me. Sorry I could not eat that. 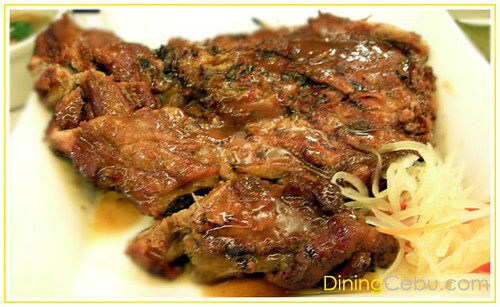 The Baby Back Ribs is my favorite food from Golden Cowrie’s menu. I always order this every time I eat at Golden Cowrie SM Cebu with my family. Unfortunately the Baby Back Ribs served in Ayala Cebu was a disappointment because they had too many bones and were undercooked. 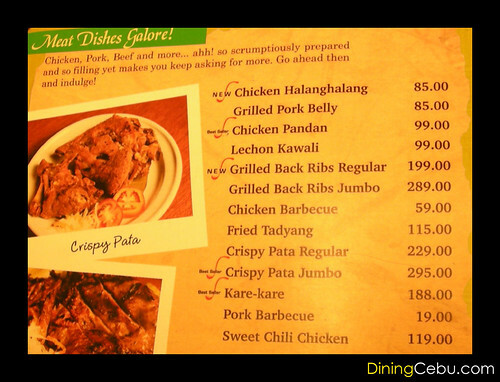 Overall I believe Golden Cowrie is still the best Filipino Restaurant here in Cebu Philippines considering the food quality and its affordable price. I must admit though that my Golden Cowrie experience in Hukad at the Terraces Ayala Cebu came as a shock to me because I did not expect such low food quality and service. Yes, it was already months ago but I can still remember it perfectly. It started with them serving me a very watery almost juice-like viscosity Mango Shake that I just had to have it replaced. Seriously, I do hope that by now Golden Cowrie at the Terraces Ayala Cebu has already improved their service and can maintain the same quality as that served in Golden Cowrie SM Cebu. Same experience I had… Right on the money! I’d rather go to the main resto @ Lahug. Sulit didto. The manager handling the Ayala branch used (?) to handle the Lahug main branch. Or basin temporary arrangement ra toh. I, too, had the same experience with the Ayala branch. I’ve also heard similar feedbacks from other people. Isn’t Hukad sa Golden Cowrie and Golden Cowrie the same? I think they have the same food but different management. @Carz: Thanks for visiting our blog 🙂 Yes that’s true, really poor service. And the sad part was that we dined there during my birthday 😦 Good thing I was just too tired to make a big deal out of it (at that time). Golden Cowrie in SM serves fairly quick even during peak hours. Yes Cowrie for pinoy food. I like their scallops.. Olio in Crossroads had really good oysters as well. Although its definately a spurge if you go. I’ve never been to hukad because I always assume they serve the same thing. Are they the same? Oh yeah, I can’t get passed by their kare-kare either.. Can’t seem to get over the nutty taste. Maybe its a manila thing..
i agree on the very slow service in ayala. 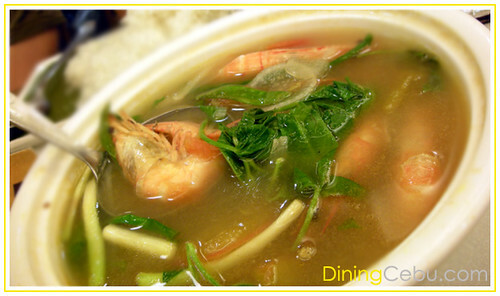 i really love their adobong talong (which did not get a mention at all. hhhmmmmm…). i do not not order this when i dine there. yumm…o! nxt tym knang cge reklamo, kamo nlay pgserve. ok? kng di mo adto nlng mo kaon sa pungko-pungko. i tried golden cowrie hugad in ayala. its a poor service i tried in most restaurant. i ask the waiter how much there salary. its only P120 net and P10 pesos allowance, how we can expect server to be past and quick service. the price that we pay and the service we get. i will not come back again. bad expereince. i cant recomment to any of my freind. then gamai ra kaau ma accomdate nila nga customers. hmmmm….im planning to go to cebu on january for the sinulog festival and I plan to check this place out together with my friends from Cebu. they say food is really great here. and looks like the price more than reasonable. just my 2 cents on the matter regarding the service and the pay that someone indicated in one of the comments. I think regardless of how much the crew are being paid by the management, they should deliver quality service, because that is what they are being paid for in the first place. If the other branches are able to deliver good service, why cant they, they should be within the same salary range. and besides, if you’re not happy with your salary and think it isnt proportional to the work you are being asked to do, then find another job right? anyway, thanks for the pics and the review. hope to enjoy my visit to cebu, I’ve been planning to do so for quite some time already. hukad in Ayala has poor service. too many waiters but doesn’t know on what to. they should have a system that would let them work systematically and efficiently. i even have to cancel an order which was already billed but not served yet and it was just a plain ice cream. guyz, yaw mo ka insecure. im a employee of golden cowrie and i know what’s behind at all.the dervice is based on standard and the food, perfectly world class.the point reactions happen maybe because of not enough managerial experience but the to think of super mga lami an ang mga food nga magpanikad ka in your next visit.og dili mo mka compare ana sa uban…thankssss….